Those of you adding Microsoft points to your account for the upcoming releases of Braid and Castle Crashers this month might want to add a few more than the 800 a shot we're used to. According to the official Japanese Xbox 360 blog, August 6th's Braid will be setting gamers back 1200 Microsoft Points ($15), with Castle Crashes weighing in at 1800 Points ($22.50?) - the most expensive Live Arcade game yet. Note that these are Japanese prices, while also noting that they generally coincide with European and North American prices. Some will meet these prices with outrage, while I say why not? I've played both of these titles (Braid extensively) and they are completely worth the extra real currency substitute. I've paid $60 for disc-based titles that had a quarter of the entertainment value of these two games. More power to them. UPDATE:Microsoft contacted Kotaku to clarify some details. 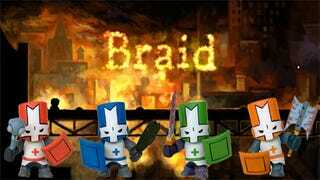 Apparently the price of Braid is listed incorrectly, with the correct price being announced Monday, while North American Castle Crashers pricing will be announced August 25th. Note they didn't say the Castle Crashers price was incorrect.